Hey folks! I'm sorry for the lack of posts. I've been kind of rushing to get stuff ready to leave town. I got my hair cut and colored today. I haven't really done a lot of "me" things besides for nail polish in long time, so it's nice to get pampered! 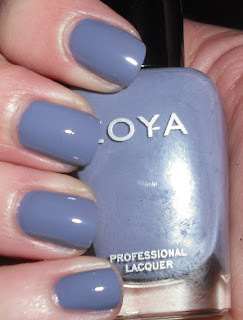 Anywho, I have a pretty spring Zoya for you! Caitlin is a medium gray with slight hint of purple creme. I love this color! Gray-purples are colors I definitely used to hate on, but now I love. I actually have been buying more gray clothes too. You know the question I asked in a poll a little while ago about what polish color you'd like to paint your room. Zoya Caitlin would definitely be contender for me. It's a nice soothing color. such a gorgeous shade! love it!! I got this one in my Birch Box and was happy to get this color. It sure is pretty on you.